Where do referrals come from? Simple question with a simple answer: Referral Sources. Unfortunately though, referral sources don’t magically appear or grow on trees. To receive referrals consistently, you need a dedicated group of referral sources that you nurture consistently. Your referral sources form the base of your healthy referral generating plan. But referral sources are more than just your current clients. So, what do you do when you need more, or even one referral source? In this article we will dive in to understanding the basics about referral sources, overcome the common misconceptions about referral sources and then go through the four steps you need to follow to start increasing your referral sources. To make this article easier to digest, I have created a mini-workbook for you so you can follow along and keep the main exercise in one place. I highly encourage you to download the workbook so you are ready when we get to Section 3. Referrals are just one type of lead generation for new clients and most would agree that they happen to be the best way to generate new clients. Prospects who are referred to you are easier to close meaning they arrive at the decision to work with you faster. This is because they trust you before meeting you, are less price sensitive and already value what you do. Because someone they trust told them that you can help them. And when it comes to making a decision on who to hire to coach us, manage our money, sell our home, insure our business, handle our bookkeeping, legally protect us or do our tax return each year…we want to know we are hiring someone who is reputable, will do a good job and – most importantly – comes recommended by someone we trust. To receive referrals – the holy grail of new client generation – we need to make sure we have a way to consistently generate referrals. Which means we need to cultivate a group of referral sources. 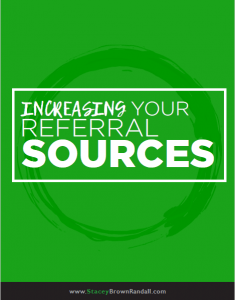 Let’s start with a look at the basics of referral sources. Referrals only come from referral sources so we need to make sure we understand who are our referral sources. What is a Referral Source? First, let’s define a referral source – a referral source is just someone who sends you referrals. A referral source is always a human. It is always a person who sends you referrals. If the new potential client doesn’t come from another human, it’s not a referral source. It’s just another type of source sending clients. There are two typical types of referral sources: Clients and Centers of Influence (COIs). Do you know which your referral source are? This one is pretty self-explanatory. The first type of referral sources is clients. They could be clients you are working with now, or clients that have worked with you in the past that aren’t currently active. It is important to note, not all clients will become referral sources, but some will. The second type of referral sources is called centers of influence (COIs). A COI is not to be confused with your entire network. Let’s just say your network, for sake of argument, is a couple thousand people. But a COI is a defined subset of those people who are in your network. They know what you do. They don’t do what you do, so there is no competitive overlap. They come across your ideal client with some regularity. A great way to think about this is from a perspective of a mortgage loan officer. Let’s use that as our example. For a mortgage broker, a great COI is a realtor. They don’t do the same thing, but obviously a realtor understands what a mortgage broker does, and realtors come across people – their clients – who are going to need financing to be able to buy a house, hence they’re going to need a mortgage broker or a loan officer. When you think about your COIs, you need to think about them as a subset of your entire network, with those very specific key parts which are: they know what you do, they don’t do what you do, and they come across your ideal client. Your COIs are not everybody in your network, even if your network is small. Meaning even if everybody in your network knows what you do, and doesn’t do what you do… it still doesn’t mean they come across your ideal client with some regularity. You need to spend time to determine who is your ideal COI referral source, along with your ideal client referral source. This article shows you how to do that specifically as you complete the four steps in Section 3. And I encourage you to download the mini-workbook – Increasing Your Referral Sources – to help you work through each of the four steps. The next thing you need to do is determine your mix of referral sources. There are three types, or three mixes of referral sources. For some of you, you’re only ever going to receive referrals from your clients meaning you have a client-only mix of referral sources. For others you’re only going to receive referrals from your centers of influence and not clients, meaning you have a COI-only mix of referral sources. But most of you are going to fall into the hybrid category, which means you’re going to receive referrals from both your clients and your COIs. The hybrid mix of referral sources is actually the most common and most people will receive referrals from clients and COIs. Let me give you a couple of examples, so you can put this into perspective for your own business. Meet my friend Stan (*not his real name) who is a fractional CFO. He helps businesses overcome major financial issues in their companies. Some are on the brink of collapse and others are just struggling to right the ship. They bring in Stan to help them get back on positive footing and in the process have to share embarrassing details of what went wrong and what (or who) caused the issues. For this reason, Stan has decided to focus on COIs as his primary referral source because he believes his clients will hesitate to mention to other business owners that they had to hire Stan. So, Stan has a COI – only referral source mix. But Michelle is completely different from Stan. Meet Growth By Referrals student Michelle who is an insurance agent and agency owner. Michelle’s firm provides insurance for two types of clients – personal insurance lines like home, auto and commercial lines for insuring businesses. Michelle has a hybrid model for her referral sources, which is most common. Michelle is definitely receiving referrals from her clients but also receives referrals from COIs who come across people who need her services. Think residential insurance passed along from a realtor or business owners who refer other business owners needing commercial insurance. She is going to focus on both clients and COIs as referral sources which means she has a hybrid model. Before we move on to the misconceptions, it is important for you to figure out which is your mix of referral sources. Or are you more of the hybrid model? Before we move on, take a moment to decide what is your mix. Now that we are clear on the definition of a referral source, the types of referral sources and you have identified your mix, I want to discuss some common misconceptions people believe about referral sources. Unfortunately, not all of your clients and COIs will refer you. I know, it’s a bummer, but it’s true. It could be because they are not built to refer you (or anyone) or they already know someone like you who they already refer people to. If they are not built to refer it is because they just don’t think in a “referring way.” Now, of course, everyone can refer, it just doesn’t come naturally to everyone. So, it is important to focus on who will refer. What I have found with the hundreds of students who have been through my Growth By Referrals program and through my research, about 30% will refer. That gives us a good baseline to build from and helps us manage our expectations. Which is why it is important to first identify who refers you and then you can focus on identifying those who have the potential to refer you. Yes, it is possible to increase the number of your referral sources – your clients and COIs who refer you – but just don’t go thinking you’re going to turn every single client, or every single COI into a referral source, ok? It is also important to keep in mind that your referral sources will refer at different rates too – some will refer a lot and some just a few. Just remember your referral sources are not all carbon copies of each other. But this is good news and should come as a big relief. Because to be honest if you’re trying to grow your business based on referrals, whether that is 75%, 50% or even 30% of your new clients coming through referrals…knowing not all will refer, or refer at the same rate, provides us with a smaller task to tackle. And I’d rather you start with some baby steps and make some great progress, then really try to eat the whole elephant in one bite. So, let’s just go step by step, coming up in Section 3. Now keep in mind, identifying your current referral sources is really easy because they are currently referring you. But we are talking about those we want to become referral sources which makes the identification process harder. When I say it is not easy to identify who will be your referral sources, what I mean is you can’t tell by looking at them (which is okay because that would be judgemental and we don’t want to be judgy people!). When trying to identify your referral sources, you can’t tell by their personality, or the energy level they have. You can’t tell by the position they’re in, or the job they have, or even by who they know. It’s not easy to identify the type of person who will be in that 30% who are more likely to refer. Coming up in Section 3 there is a process I will teach you to make this easier but there is no magic bullet to easily identify who will refer you. It just doesn’t exist. You can’t make judgments, and you can’t assume who will be the perfect referral sources. Your list of referral sources is a changing, ever-fluid list and you need to understand and accept it. Referral sources change because people move away, change jobs, sell their companies, or change the direction of their business so they’re no longer coming across your ideal client. You have to keep in mind – client or COI referral sources – once they become a referral source it is your job to do everything you can to keep them as a referral source. But you have to understand that it’s fluid, and your referral source list will change. And sometimes you may just decide to remove a referral source from the list and its not because of the reasons listed above. You have just decided you no longer want to cultivate referrals from them. 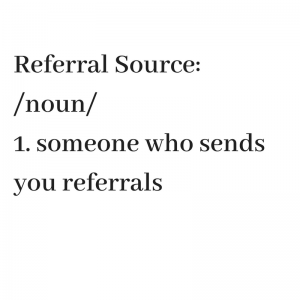 My Growth By Referrals students know – as I teach in the program – it is important, at the end of every year, to review our list of referral sources and consider if we have some non-generating referral sources. My advice to my Growth By Referral students is don’t ever cut anyone after the first year. You should keep them on your list a second year just to see what happens. But you have to recognize that eventually – at some point – you’re going to have to trim your referral source list. Just because they’re on the list, doesn’t mean they’ll stay on there forever. 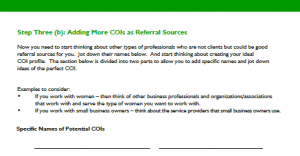 Okay, let’s get into the nitty-gritty of how to turn clients and COIs into referral sources. This section is broken down into the four steps you need to follow to get started with increasing your referral sources. The workbook is broken down in a repeating pattern – applying that particular step to clients and then COIs. Then it moves to the next step in the process. When you think about your clients, I want you to write down the names of your clients who currently refer you. If you are using the mini-workbook, there is a place for you to write them down in the left column. But if you’re just grabbing a piece of paper, create two columns and on left side, write down the names of your clients who currently refer you. Then next to that, in the right column, I want you to think about what those clients, those clients who refer you have in common. We are looking to see if there are any patterns when you’re looking at other clients who are more likely to refer. Now like I said earlier your potential referral sources aren’t easily identifiable, right? So we have to start looking for patterns. The reason we identify patterns in our current referral sources is to help us determine where to focus for other potential referral sources. Next, you will do the exact same process with your centers of influence. If you are following along in the mini-workbook then move down below the client list to the COI section and list out the names of your COIs who currently refer you. And, I want you to add a step to the COI part…I also want you to write down the names of those who make introductions to other professionals and business owners. 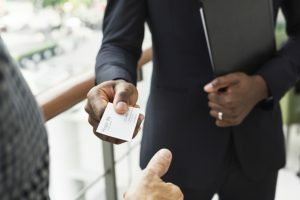 They may not refer you to someone who needs to hire you, but they’re definitely the type of person who makes introductions for you, helping you to grow your network, meet new people, connect with additional COIs. And then in the right column across from the COI names, I want you to write down what they have in common, just like you did for your referring clients. Make sure to consider what’s unique to them, but also what they have in common. This process helps us to establish patterns of the types of COIs who are more likely to refer us. Now that step 1 is complete you need to answer some simple questions for step 2 based on your answers from step 1. You won’t be able to answer these questions until you’ve done step 1. Here are three questions I want you to ask yourself when you are thinking about the answers you just gave in step one. (If you are following along in the mini-workbook, this is step 2). Remember, keeping the work together in one place – the workbook – gives you the best chance to taking action after you complete the four steps. 1. When you identified your current clients and your current centers of influence who refer you, were you surprised by who was on the list? And who wasn’t? When you thought about who the referring clients are, and who the referring COIs are, did anything catch you by surprise? And it may not have been who was on the list, but who wasn’t on the list. That’s an important one to pay attention to. A lot of times we go off of anecdotal evidence. We just remember the last three referrals we received and who sent them. Or we just think a particular person gives us a lot of referrals because one time they did refers us and we made that bigger in our minds. But when we start looking at the data, we realize our anecdotal evidence is not clear evidence in terms of what the data is actually showing us. That’s why we go through step 1 in this 4-step process. 2. What can you do to make better connections and strengthen the relationships with those who are your current referral sources? What I find sometimes with my Growth By Referrals (GBR) students – after they go through the identify and assess (Step 1) – there are a few responses. When they review the list of people who have referred them, they have that moment of, “Oh, my gosh, I haven’t talked to that person in 6 months, and in the last year they’ve referred me three people.” Or “I had no idea that person referred me so many people.” Or “Why isn’t so and so on the list, I spend so much time networking with them?” It’s really good to assess who are your referral sources. Who are those people taking time to refer you, and what are you doing to make sure you have a strong solid relationship with them. 3. Do you need more referral sources? Depending on how many referral sources you identified from step one, you’ve probably realized it would be great to have more referral sources. Keep in mind most of us don’t need hundreds of referral sources, unless you are going for extreme volume. So, one to two dozens of referral sources is a good target to aim for as you are starting out. Now, the next step is to consider if anyone should come off the list because they haven’t referred you in a few years. If someone referred you 4 years ago and not since, they may not be a strong referral source. So you might need to consider trimming your list. Now there could be the 1% who goes through step 1 and step 2 and realizes, “Nope, I have all the referral sources I need and things are great.” Well, if that is you – perfect. You don’t need to continue on to part three of this four part process. 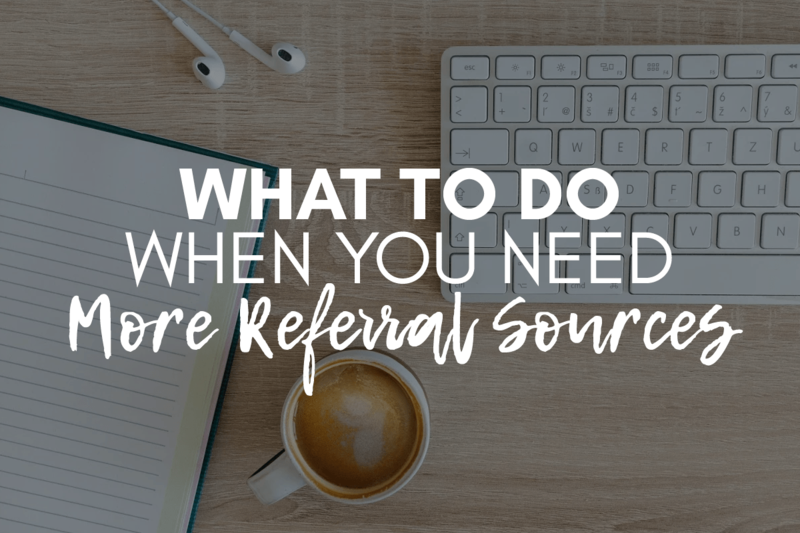 But for those of you who said, “Yes, I need more referral sources, so I can receive more referrals,” then let’s keep going with the final two steps of the process where we look to start growing or increasing our number of referral sources. Now that you have assessed your current client referral sources and current COIs referral sources, we now need to take the next step to help you increase your overall number of referral sources. And you may not have had many – or any – people on the list, and that’s okay. Step Three and Step Four will help you solve that problem. You’ll notice in your mini-workbook I have broken this step down into two steps – 3A and 3B – to make it more manageable. Step 3A is focused on clients and Step #B is focus on COIs. Let’s start with Step 3A, which is focused on adding more clients as referral sources. You need to start thinking about the clients who weren’t on your list in Step 1. When you answered the truth question in Step Two, were you surprised by who wasn’t on the list? This is your opportunity to consider the clients who aren’t referring you now but you would like them to refer you. Start by writing down their names in the workbook. Now keep in mind you won’t actually know if the clients you wrote down will become great referral sources. This is going to take some trial and error and I’ll provide an opportunity where you can learn an easy way to do that if you are interested. But for right now, just start thinking about which clients you want to cultivate as referral sources. Here is what the layout of section 3A looks like in the mini-workbook. To truly be able to consider all of your options of clients as referral sources, you’ll need to target past clients, not just current clients. And you may even need to pull a list of your clients to jog your memory. Like that client who worked with you three years ago that just adored working with you, but you haven’t really kept in touch with them and you are certainly not top of mind with them anymore. Again, you’re not going to turn all of the clients you write down into referral sources. But, you definitely won’t be able to turn anyone into a referral source unless you start by identifying who *may* become a good referral source. Make sure you show a little judgment. You know there are some people that didn’t have the best client experience with you. Maybe they became a client at a point in your business where you were growing faster than you could handle and your processes broke down. Or maybe, for whatever reason, what they experienced with you wasn’t all that positive. It is important to note, you are NOT creating a list of all of the clients you have ever worked with. Again, show a little judgement as to those who may become good referral sources. But what if you are new in business? What if you have been in business for less than 2 to 3 years? What if you’ve only worked with a dozen or so clients? Since your client list is small enough I would suggest you put all of your clients on there. And then, as you go through the process of turning these clients into referral sources, you will figure out who will stay on the list and who will not. But, if you have been in business longer and have more clients (like 100s), remember, we’re just aiming for the 30% that we think will refer us. We don’t expect to get it all correct and we do expect to be surprised. Most importantly, we just need to start somewhere. Now, let’s take the same process from Step 3A and apply it to our COIs. But with COIs we are going to add an additional step to this process. Remember our COIs are those who know what we do, don’t do what we do and come across our ideal clients. In the workbook, jot down the specific names of your COIs who you would like to be referring you. This might include people you know well or don’t know well – from your general network – with your goal to have them become COIs referral sources. That’s right – to develop a list of potential COI referral sources we need to start a little more broad and then narrow it down. Here are some helpful tips to help you create a robust list of potential COIs. Review your calendar of those you’ve met with for coffee or a meeting over the last six months or longer. Pull up LinkedIn and start scrolling through your 1st degree connections and then your 2nd degree connections. Now word of caution, use your judgement of who you add to your possible COI list. If you haven’t talked to someone in three years, they may not be worth adding to your list. After you have your list of potential COI referral sources, we need to move on to the second part for our COI cultivation. We need to create our ideal center of influence profile. In the workbook you’ll see this part – the bottom half of Step 3B. If you’ve never considered who would make the “ideal” COI for you, it is similar to the process you may have gone through when you were considering who your ideal client is. As a business owner, it is important to know who is your ideal client…those clients who come to you and they need exactly what you have to offer. They have the money to be able to afford you. Maybe they’re in the right geographical location or in the right age demographic. Maybe they’re at a certain stage or level with their business. We want to take that same process and apply it to our COIs which will help us create an ideal COI profile. As you complete this section of the workbook – your goal is to list out the characteristics you think will make an ideal COI. This step is all about profiling for now. We’re not coming up with names of those we know, that was the section above. Right now, we’re just trying to figure out, what are the identifiers or characteristics that would make a great COI referral source? Here is an example…let’s say you only work with women. Sorry guys, nothing personal, just an example. Think about the business professionals who may cater to women but go a little further and consider organizations and associations that work with and serve women. Specifically the organizations and associations that serve the type of women you want to work with. Using my coaching practice as an example, my target ideal COIs were financial advisors, CPAs, and business consultants who worked with small business owners. They weren’t my only COIs over the years, but having these three targets gave me a place to start to identify who else I wanted to get to know to try to cultivate them as a COI referral source. We want to make sure we understand who would make the best type of COI referral source. There isn’t just one. So, list out options, industries, roles, organizations, vendor types who are already serving your clients. List out that information so you have a firm idea of your ideal COI profile, a target profile so to speak. This will help you identify who you should focus on meeting and getting to know if you need to add more COI referral sources. After you have started forming new relationships, your next step will be to take specific steps to strengthen and build relationships with them. Don’t worry about this yet, but details about this next step can be found here. Okay – do a happy dance, we are on our final step – Step 4. And the good news is…Step 4 is just three questions. Here we go. 1. Look back over the list of current client referral sources (Step 1) and compare to the list of potential client referral sources (Step 3A)…is there a pattern? Did you identify patterns between the list current clients who are referring you and the list of soon-to-be client referral sources? Is there a link, a pattern, or a thread? You may not have and that is okay but any pattern established could provide a direction to consider for the types of clients who could become referral sources. 2. Look back over the list of COIs currently referring you (Step 1) versus the list of potential COI referral sources (Step 3)…is there a pattern? Did you identify patterns between the list current COIs who are referring you and the list of soon-to-be COI referral sources (Step 3B)? Is there a link, a pattern, or a thread? You may not have and that is okay but any pattern established could provide a direction to consider for the types of COIs who could become referral sources. 3. Take a look at your ideal COI profile and ask yourself where those ideal COIs hang out, who they do business with, etc.? If you did, we now have something to work with. At some point in your journey to increase the number of referral sources you have, you will need to use your ideal COI profile to help you start developing additional COI referral sources. So please go one step further with your ideal COI profile and write down who fits that profile. This way, when you need this list, it is ready to go. I also provide more support in how to do this during the two-hour Increase Your Referral Sources Masterclass. After completing the four steps in this process, your next step is to create your action plan to take care of your current referral sources and soon-to-be referral sources. From this process you have two solid lists of gold…one is a list of current referral sources (client and COI) and one is a list of potential referral sources (client and COI). The easiest way to gain control of this process is to put it in context of the number of new clients you actually need to bring in this year. If you only need 50 new clients – then two dozen referral sources who give you 1 to 2 referrals gets you very close to your goal of 50. That is not saying you will close every referral you receive, but if half of your new clients come through referral, how much easier does that make your new client acquisition process this year? Determine How Many Referral Sources You Need? Once you are clear on the number of referrals you actually need, based on number of new clients you need per year… more than likely you don’t need hundreds of referral sources. But, less than five referral sources probably won’t work for you either. I tell my students in the Growth By Referrals program, let’s aim for a dozen or two dozen referral sources to start and grow from there, only if we need it. If you are a business owner who only needs 25 new clients in a year then you need about about one to two dozen referral sources sending you one to two referrals a year. The number of new clients you need every year is typically what indicates the number of referral sources you need, based on how well those referral sources produce results. And of course, you won’t close every referral you receive. But receiving a referred new potential client is the easiest way to get to the number of new clients you need per year. To get there you do need a dedicated list of referral sources who do refer you. Remember no one refers someone they don’t trust and people typically trust people they know, not strangers. So your next step is to start building relationships. Which I know is easier said than done but the next step in this process can be easy if you allow it to be. There is work involved, but if you have a process to manage your relationship-building, then you will be able to make it a part of your workflow so it actually happens. You may be one of those people who knows instantly what to do to start developing relationships with people you know and with strangers. But if you are like most people – having a road map to follow gives you the confidence you need to get started. I offer a masterclass – Increasing Your Referral Sources – that teaches you exactly how to take your lists of potential referral sources through a process to nurture them to become referral sources. None of it is rocket science, but if you like step-by-step processes to hold you accountable and show you how to do so you don’t waste time on mistakes, then check out this masterclass. As we wrap up, here’s what I need you to understand. Increasing your referral sources really comes down to developing relationships with the people who have potential to become referral sources. They will not become referral sources overnight. And they will not become referral sources just because you had one meeting with them to get to know them. You are going to have to establish a relationship with them where trust is established and nurtured. And this is more of a long-term game than a short-term fix. We’re not looking for a band-aid approach that will stop working in a few months. We’re looking to systematically grow our business in the best and easiest way possible. Which means we have to do a little bit of work to develop more referral sources so that our business is sustained by referrals, and we are not worrying or stressing out about where the next client is coming from. My goal is to help you leave behind the entrepreneurial roller coaster and those feast or famine months. Your job is to meet me halfway and be willing to do a little work to receive the rewards you deserve – in this case – the referrals your deserve. So, are you ready to get started? Let me know in the comments how you did completing the workbook and what your first step will be to put your work into action so you can have some results! I have finished reading your book, congratulations and well done! I want to grow my business with you assistance. I had previously communicated with you, informing you that I am a new Realtor- 15 months- with no prior sales experience. I trained as a Physical Therapist , worked as such, then left to manage my husband’s cardiology practice when he went into private practice for 22 years until he sold it to a Healthcare group a few years ago. I chose real estate because I can be successful at it, and your approach resonates with me because I believe though I am an introvert, I am empathetic and building relationships as a means of growing and sustaining a successful business is a model that has worked for me in the past. Ethics and hard work are very important to me. Even though I don’t have much field experience in Real Estate, I have spent the last few years acquiring as much knowledge and information as I can lay my hands on. Hi Bunmi! I am so glad you loved my book and are consuming my resources. I noticed you signed up for one of my webinars, How to Become a Referral Ninja Beginner. I look forward to working with you in the near future. Let me know when you are ready for my Growth By Referrals program! I realized through this exercise I have a lot of work to do. I definitely need work on my referral platform. This exercise was an eye opener and make me sit up straight. Now I have to move onto the next steps. thanks Stacey. You can do this!!! If you need my help, I am here! Stacey's new book Generating Business Referrals Without Asking is finally available!